An artist, Givens graduated from high school in southern California and, after working for a year as a freelance artist, got a job lead — at the Walt Disney Studios. The year: 1937. He started as an “animation checker” to ensure Donald Duck cartoons were coming out right, and then was assigned to work on the studio’s first feature-length film: Snow White and the Seven Dwarfs. After a few years there, he moved to Warner Brothers to work with Chuck Jones and Tex Avery — on their Looney Tunes and Merrie Melodies staff. 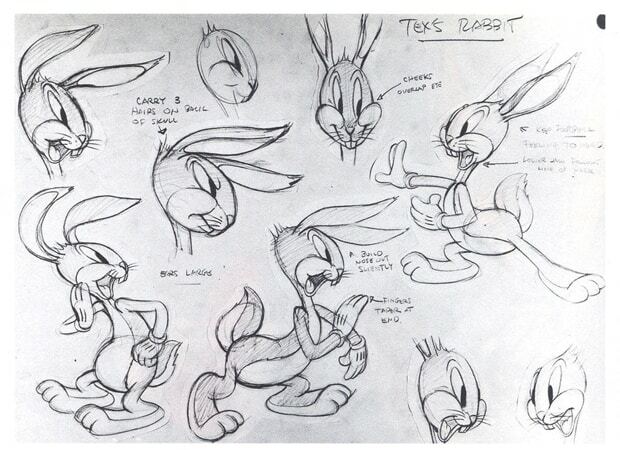 Givens’ original Bugs Bunny designs: note it’s not named yet, just “Tex’s Rabbit”. Click to see larger. In 1940, Avery brought Givens a new character to design; his earlier sketches were “too cute,” Avery said, and wanted Givens to fix it: a rabbit character which wasn’t quite well defined, and didn’t even have a name yet. 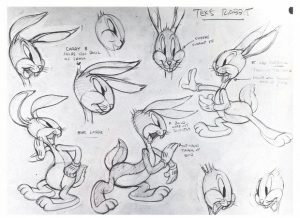 Once Givens got the character designed (pictured), it was given a name: Bugs Bunny — who would grow into the studio’s biggest star. That first Bugs Bunny cartoon, A Wild Hare, was released on July 27 of that year, with Mel Blanc voicing that line: “What’s up, Doc?” Givens also designed Elmer Fudd’s look, but his career was interrupted when he was drafted for World War II. He got a good assignment: he made military training films with a fellow Warner animator. After the war, Givens continued to jump around a bit, working at Warner, Hanna-Barbera, UPA, DePatie-Freleng, and others, and returned to Warner for the last original Bugs short, False Hare (1965 — poor Bugs didn’t work again until Box Office Bunny in 1991). Givens was the last of the major players involved with the production of A Wild Hare; he died at a hospital in Burbank, Calif., on December 14, at 99.